“After the death of Abraham, God blessed Isaac his son. And Isaac dwelt at Beerlahairoi” (Genesis 25:11). This is the first time that the Bible states that God blessed Isaac. The timing of this act of blessing is important. Isaac had just lost his father. “Then Isaac brought her into the tent, and took Rebekah, and she became his wife; and he loved her. So Isaac was comforted after his mother’s death” (Genesis 24:67). So, Abraham arranged for him to be comforted at that time and he was comforted. This time, Abraham could no longer arrange for him to be comforted. He was dead! Isaac must have felt it very much. There is a sense in which even Rebekah his wife could not comfort him. It was then that God stepped in and blessed him with the gift of consolation. The Lord reached out to him and healed the wounds that the death of Abraham had caused. He also stepped in to fill the vacuum that was created by that departure. You may be in the same plight. Have you lost a husband, a wife, a son or a daughter? Has someone gone to be with the Lord and that departure is eating deep into you? “Fear not, for l am with you, be not dismayed, for l am your God; l will strengthen you, l will help you, l will uphold you with my victorious right hand” (Isaiah 41:10). “Fear not, for l have redeemed you; l have called you by name, you are mine. When you pass through the waters l will be with you; and through the rivers, they shall not overwhelm you; when you walk through fire you shall not be burned, and the flame shall not consume you. For l am the Lord your God, the Holy One of Israel, your Saviour. l give Egypt as your ransom, Ethiopia and Seba in exchange for you. Because you are precious in my eyes, and honoured, and l love you, l give men in return for you, peoples in exchange for your life. Fear not, for l am with you; l will bring your offspring from the east, and from the west l will gather you; l will say to the north, Give up, and to the south, Do not withhold; bring my sons from afar and my daughters from the end of the earth, every one who is called by my name, whom l created for my glory, whom l formed and made” (Isaiah 43:1-7). “l am the Lord, your Holy One, the Creator of Israel, your King.” Thus says the Lord, who makes a way in the sea, a path in the mighty waters, who brings forth chariot and horse, army and warrior; they lie down, they cannot rise,they are extinguished, quenched like a wick: “Remember not the former things, nor consider the things of old. Behold, l am doing a new thing; now it springs forth, do you not perceive it? l will make a way in the wilderness and rivers in the desert” (Isaiah 43:15-20). So the Lord showered the blessing of comfort on Isaac. The blessing reached out to him and healed him. The Lord also blessed Isaac by giving him Himself. Before, Abraham was Isaac’s father. Now, Abraham was dead. Isaac needed another father. The Lord blessed him by giving him Himself. The Lord became Isaac’s Father. So Isaac was comforted and had a Father. HOW GREAT THE BLESSING OF THE LORD IS! Isaac lost an earthly father. God blessed him with a heavenly Father. He lost a mortal father. God gave him an immortal Father. He lost a father who had limitations. God gave him a Father whose love, power, might, grace and all else was limitless. Yes, God did a great thing. He blessed Isaac so much that his later position was better than the first. The blessings of God always raise a man to newer levels of wealth. Open your heart and life to the blessings of God today! Because God blessed Isaac, he was able to continue to stay in Beerlahairoi. He was not afraid. He was not frightened. He was not alone. God was his Father and God was there. The problem with many of God’s children is that they do not know how to wait on God. Immediately they are faced with a new situation, instead of turning to the Lord and seeking His face, waiting for Him to act on their behalf or to show them what they are to do, they instead turn to themselves or to other people and initiate things according to their understanding and will. These man-initiated projects must depend on man for success and, because of the limitations of man, he must strive in every way and manipulate everything so that the project might work. This carnal energy invested by man to ensure that what the Lord has not started works, is the basic cause of restlessness among the children of God. The believer who has thus prayed must continue to wait on the Lord. The Lord will show him what to do. Until he has heard from the Lord, he must do nothing else but praise and offer thanks as well as continuing to seek God’s face. This is the pathway of rest. It is the secret of spiritual rest. Remember, all that begins in man is human, earthly and will lead to restlessness. On the other hand, all that begins in the Lord is divine and will lead to rest. All that is done by man’s methods and in man’s timing will lead to restlessness. All that is done by God’s methods and in God’s timing will lead to rest. All that is done by human power will lead to restlessness. All that is done by God’s power at God’s bidding will lead to rest. God’s will is that by allowing Him to take the initiative and then by fitting in to co-operate with Him at His bidding, man should enter into the rest of God and abide in the rest of God. “So then, there remains a sabbath rest for the people of God; for whoever enters God’s rest also ceases from his labours as God did from his. Let us therefore strive to enter that rest, that no one fall by the same sort of disobedience” (Hebrews 4:9-11). Man must cease from his (man’s) labours in order to enter into the rest of God. Those who have entered into the rest of God carry out the labours of God! The Secret of Spiritual Rest: God initiates all that is to be done. Man waits on God and does what God commands him to do. He, therefore, does God’s thing God’s way for God’s glory, and all this is done from the rest of God. LABOURING TO ENTER INTO REST. The Bible exhorts believers to labour or strive to enter into rest. The question is, “How can rest come out of strife?” The answer is that the striving to enter into rest is that of striving to do nothing! Naturally, man will act in the face of every new situation. If he is to do nothing but wait on the Lord and pray until he has heard God, he must exert a force that will overcome the natural force of human acting before God has spoken. 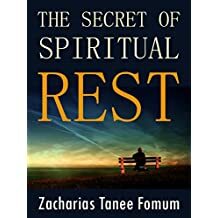 That force that overcomes the natural force of human activity is the power of the Holy Spirit that is specially at work to bring God’s children to rest and to keep them at rest. Ask that that power be poured out abundantly on you by the Father. This will overcome your natural power and enable you to wait on the Lord; to be at rest in your inner man. God bless You! He blessed Isaac and so Isaac stayed where he was! He will do the same for you. Why not turn to Him now and ask Him for the power to wait on Him in every crisis? Why not ask Him for the power to pray and wait on Him instead of the natural tendency to pray and then act before God has revealed His will? Be assured that if you ask, you will receive; for He has promised.